The Davie Village Community Garden. The planned 43-story condo development. For ten years the lot on the north-west corner of Burrard and Davie streets has been a thriving community garden, located on the site of a former Shell service station. Late last month the property’s owners, Prima Properties posted signage informing the community of the garden’s forthcoming closure and the construction of a 43-storey condo tower to come. This isn’t the first indication of the plan. Prima Properties held an open house last July and unveiled plans for the tower, designed by Merrick Architecture. The lot had previously been identified by the City of Vancouver in the 2013 West End Community Plan as a site for higher buildings up to 375 feet. The market condo tower will include 271 units, ranging from studios to two bedroom and den units, as well as 233 parking spaces and 356 bike parking stalls. Fifty percent of the units are promised to be suitable for families (two bedroom or larger). The West End Journal is aiming to bring you monthly updates on the current and proposed developments around our community. This is a preliminary listing and we will have more details, and information from the City and developers, in future issues. 1444 Nicola: Two towers of 43 and 48 storeys with approximately 491 units (358 strata units and 133 market rental residential). 1568: A 43-storey tower with an average price tag of $2,000 per square foot. 1188 (at Davie): , 22 stories of 108 pet-friendly studio, one, two, and three bedroom rental apartments. Projected completion in the fall / winter of 2019. A Reliance Properties development. A 56-story tower behind First Baptist Church. 969 @ Nelson: First Baptist Church plans the restoration of the church along with new church ancillary spaces including a 37-space child daycare, a gymnasium, a counselling centre, and offices. 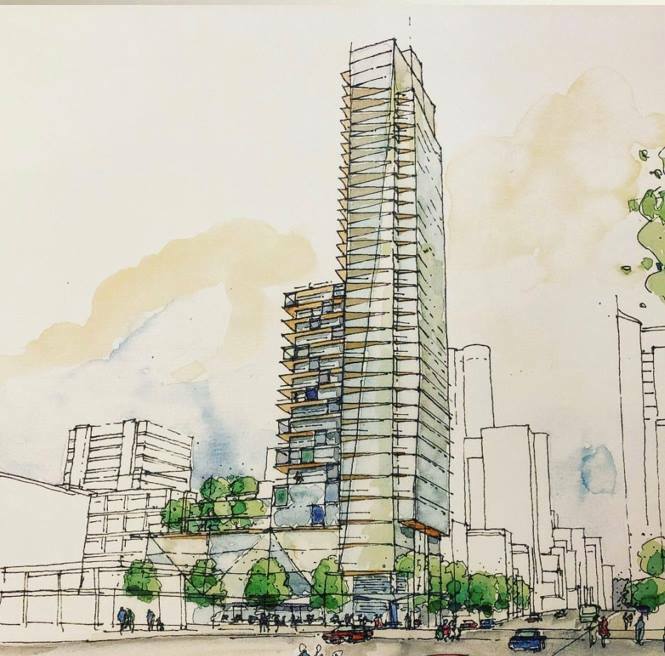 A new 56-story tower will contain 294 market strata residential units and a new eight-story building will contain 66 housing units, owned by the church. 497 underground parking spaces. The Butterfly, Bing Thom's last addition to Vancouver's skyline, is set for completion in the spring of 2023. 1345: Mirabel. Side-by-side 18 and 19-storey buildings with a total of 149 units; 36 studio/one-bedreom/one-bedroom and den, 105 two-bedroom, and eight three-bedroom homes, plus 68 social housing units that will be owned by the City of Vancouver. 1550 / Gabriola House: Sometimes mistakenly referred to as "Gabriola Mansion" since its years as Hy's Mansion restaurant, this West End icon is in the process of being converted into 16 market rental suites, with the addition of four three-story market rental townhouses on the northeast corner of the property. Find The West End Journal's coverage from last March here. 1600 Block: Site of the old Safeway, along with numerous other longtime West End businesses. Apparently Safeway will re-open in the new building. 1698 : Proposed 46-storey residential building with 128 market units. (Note: This project is outside of the designated West End Plan area). At the site of the former Chevron gas station. 1540: Interior and exterior alterations and an addition to the existing 27-unit multiple dwelling building will add four dwelling units on the main floor by enclosing a portion of the existing parking garage and reducing onsite parking to six spaces. 1250: Between Bute and Jervis. Terrace House. Touted as the world's tallest mostly-wood building, it will stand 19 stories tall behind, and designed as a tribute to, Arthur Erickson's decades old Evergreen. 1435: Approved on March 20, 2017. 1488: Proposal for a 31 and 32 storey mixed-use building with 63 units of social housing and 237 market units. 1500: Proposed 21-storey mixed-use building with 127 secured market rental units. The Development Permit Board meets every other week from 3 to 6 p.m. at Vancouver City Hall (453 West 12th). Upcoming meetings are scheduled for March 4 and 18. Learn more about the Development Permit Board here, where you can find information on upcoming meetings, documents, and minutes, and register to speak. Agendas a reports are usually available online five days prior to each meeting.